Ketchikan, Alaska - You have to hand it to Emery Tobin: He was one tenacious guy. It must have been in his blood, inherited from his father August Tobin. Back in 1898 August Tobin left his family-wife Emma and two children, Emery and Florence-in Boston and struck out for Alaska. "He was going to find gold and get rich quick-in a year," Emery Tobin said of his father in a 1965 interview. August Tobin, however, fell under the spell of the Arctic and "instead of spending a year in Alaska, my father spent the rest of his life." After 20 years near Wiseman, Alaska, August Tobin gave up on gold, started working his way south, made it as far as Ketchikan, and could not bring himself to go farther. He did not want to leave Alaska. So in 1920, at the age of 25, Emery Tobin met his dad in Ketchikan, at that time a bustling fishing village of about 2500. Both Emery and August found jobs at the New England Fish Company, Emery in the office and August in the cold storage plant. By 1921 they'd saved enough money to send for Emery's mother and sister. "Together at last, our family enjoyed some of the happiest years of our lives in Ketchikan," wrote Florence (Tobin) Thornton in an Alaska Magazine article. But there was one problem: August Tobin was an alcoholic. Twenty years in the Arctic had taken their toll and he'd dealt with his loneliness and lack of success by drowning it in a bottle. The problem haunted the family and they tried to cover it up as best they could. People said it could not be done. You could not start a magazine in Ketchikan during the depression years of the 1930s. There was no money and not many people, a mere few thousand in town and only 63,000 in the territory. Even if you could find the capital to get started, you could not make enough to continue. Emery Tobin, however, knew it could be done. The Alaska Sportsman in the old hospital building-1952. Tobin believed in Ketchikan and Alaska, its scenic beauty and outdoor wilderness, and wanted to tell the world about it. What better way than a magazine? Tobin also believed he was the man to do the job. He had journalism experience, an out-going personality, plenty of energy-and his wife Clara. He'd met Clara while traveling on a ship and proposed to her near Eddystone Rock in Behm Canal. Clara was a school teacher with a good head for business, a love of the outdoors and a belief in Tobin's dream-though perhaps not quite as strong as his own! Together Emery and Clara organized "the Alaska Sportsman Association," which became the driving force behind the magazine. "We started on a frayed shoe string," Tobin recalled with a chuckle. "We set up an office on the [downtown steamship] dock in an old ramshackle building." The first issue of The Alaska Sportsman (TAS) came out as a supplement to the Ketchikan Chronicle in January 1935. Tobin managed to publish monthly until 1941 when a fire destroyed the dock building and he moved the magazine to the old Arthur Yates Memorial Hospital building on Mission Street. By now World War II was raging and restricting shipping and supplies to Alaska. Tobin found it difficult to get even basic materials, like ink, paper and wire for the stapler. Still, he managed to put out an issue every month. After the war Tobin remodeled the hospital building. 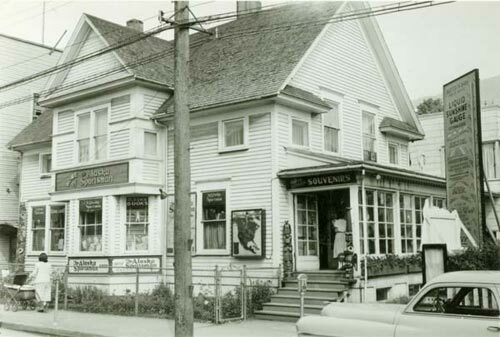 He added space for the "Alaska Specialties Company"-a curio business that he hoped would support the magazine-and rooms upstairs and in back of the building. The Tobin family, which by now included young daughter Doris, moved into three of the rooms and rented out the rest. To keep the magazine afloat Tobin also borrowed money from his sister Florence and from the Miners and Merchants Bank. When still more financing was needed Clara Tobin sold off much of her family inheritance, including acres of timberland in Washington State. 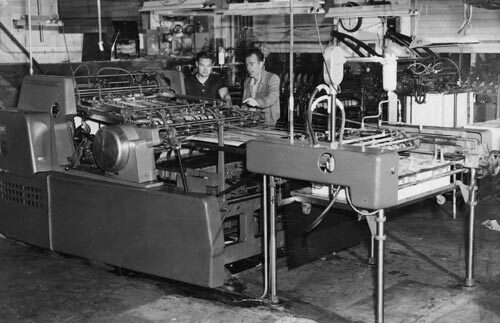 New Kelly Press for the Alaska Sportsman; printer Harry Romine on left. Crime, Corruption and the "Citizen Investigation"
For years Tobin had trouble dealing with his father's drinking. He grew to hate alcohol and everything that went with it: saloons, bars, gambling, bootlegging, not to mention graft, prostitution and murder. All these evils proliferated in Ketchikan and Tobin crusaded against them. He became most concerned about "the growing number of mysterious deaths that smacked of murder but were never solved." Every year a number of dead bodies floated down Ketchikan Creek and ended up in Thomas Basin. "They pulled out about eight bodies of fishermen a year," Tobin wrote. "They would get drunk and doped up on Creek Street." When not enough was done by the police department, Tobin began his own "citizen investigation." By working with certain "honest policemen," he learned of shocking crimes in the department itself-cover-ups, kickbacks, policemen who drank on the job, stole money from prisoners and "consorted with prostitutes." He also investigated the office of the U. S. District Attorney. "I found that serious cases were being disposed of by district attorneys in unusual and suspicious manners," he wrote. "In many cases no charge was filed even though the evidence showed that violence had occurred." 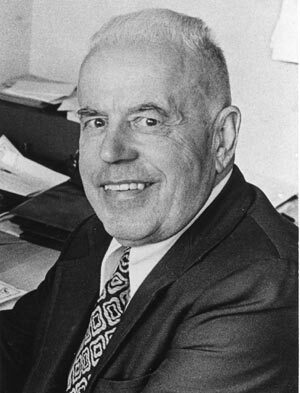 During the early 1950s Tobin wrote articles, editorials and letters-to-the-editor, informing the public of his findings. He wrote about a study done by the American Social Hygiene Association: When it came to prostitution, crime and corruption, Ketchikan was worse than 95 percent of all U.S. cities! In 1953 he testified before a federal Grand Jury, revealing everything he knew about corruption. The Grand Jury indicted the police chief on four counts, which were reduced to "conspiracy to permit prostitution." The chief pleaded guilty and left town. The police captain pleaded guilty to the same crime and was suspended, and the district attorney resigned. "In the last one-and-a-half years, there has been only one drowning in Thomas Basin!" Tobin exalted to a friend. "People who spend time in God's great outdoors appreciate the beauty and harmony they find there," Tobin wrote in 1954. He loved the outdoors and when the sun came out dropped whatever he was doing to get outside, recalls his daughter Doris (Tobin) Bordine. "We had a boat from almost as long as I can remember," Bordine says. "Emery's desk would be piled high with work he left undone to get out in the country." Protecting the wilderness and its wildlife became another Tobin crusade. 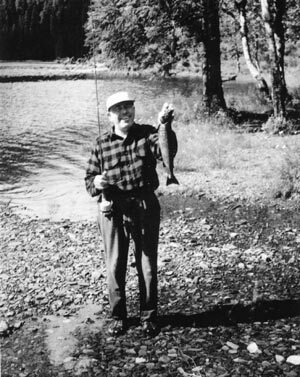 One of his favorite fishing streams was the Naha River, which in the 1920s had been over-fished and its sockeye runs depleted. By 1946, though, the runs had improved and Tobin wrote an editorial crediting stream guard Milton Orton: "The salmon run has been building up on this river because a stream guard has been here for twenty years. What has been done on the Naha can and should be done on every other salmon stream in Southeastern Alaska." Tobin also wanted to protect ancient Native burial sites in wilderness areas. Over the years graves had been vandalized by "looters, who stole artifacts, beads, even bones of the dead." He visited an old "grave-island" on the west coast of Prince of Wales and found that "the Indian graves among the trees had been looted and most of the marble grave monuments toppled and broken. Part of an old sewing machine was all that was left of effects for use of the departed in the hereafter. It was a sad scene." Tobin also located the burial site of a Tlingit shaman and his slave, which had survived somewhat intact: "The mummy-like skeleton of the medicine man was clothed in tanned, greenish hide, the effect of inexpert embalming. Several chests and a burial box had been protected for more than 150 years." Ketchikan book signing by Harriet Rossiter, hosted by Emery and Clara Tobin. 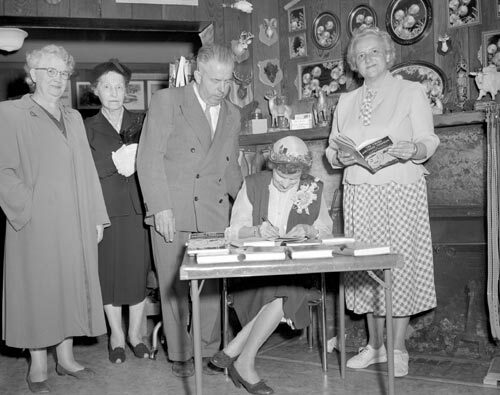 Clara Tobin is holding the book on right. In 1958 Emery and Clara Tobin sold The Alaska Sportsman to two Juneau journalists, Robert A. Henning and Robert N. DeArmond. At the time TAS boasted a circulation of 65,000 and was recognized as "the largest outdoor sports publication west of the Mississippi," according to the Ketchikan Daily News. In 1966 the Tobins sold the Alaska Specialties Company and retired to Vancouver, Washington, returning each summer to visit friends in Ketchikan. In 1977 Tobin died and today his ashes (and Clara's) rest on Eddystone Rock in East Behm Canal-where his tenacious spirit likely continues to roam. Bordine, Doris Tobin. Personal interview, Ketchikan, Alaska: 2005. Dassow, Ethel. "The Voice of the Last Frontier," Alaska Magazine: October, 1984. Thornton, Florence Tobin. "Father Wanted Gold," Alaska Magazine: June, 1983. Tobin, Emery F. Personal interview, Oral History Project, Ketchikan, Alaska: 1965. Tobin, Emery F. "Main Trails and Bypaths," The Alaska Sportsman: January, 1946. Tobin, Emery F. "We Cruised Around Prince of Wales Island," Alaska Magazine: October, 1971. Tobin, Emery F. "Main Trails and Bypaths," The Alaska Sportsman: 1955. Tobin, Emery F. Personal papers, Ketchikan, Alaska: 1920-1955.